Having helped Rob Dawson step and un-step the mast I was concerned about my ability to do this on my own. I did some searching on the web and found that the Freedom 21 has a keel stepped mast with a hole on the deck. I set about making a small version of the device used in the following document. This link sometimes fails, if you have a problem with it please let me know using the contact form and I’ll send you a copy. This consisted of an 8 foot high A-frame with a cross piece that presses on the front of the cabin. This slopes to a point where the top of the A is directly over the mast cone. It has 2 rope guys tied at the boat’s winches and one to the bow. 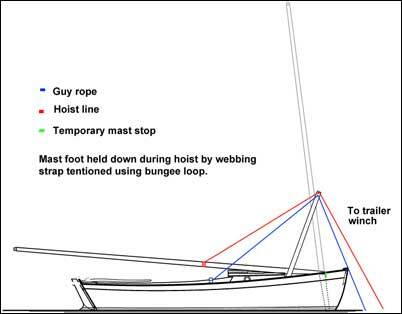 The foot of the mast is held down by a 50mm web strap which is held taught by a loop of bungee and up the mast by another loop of bungee to the cleat on the mast. The foot of the mast presses against a wooden T piece stop that lodges in place and is held down by a web ratchet over the bow. This all sounds a bit complicated but is very simple in reality, what I was trying to achieve was to have the foot of the mast held securely in place by an arrangement that automatically moved out of the way as the mast dropped into the slot. There’s a block in the top of the A frame and a rope passes over this to a point on the mast approximately 9 feet from the foot. In fact I set it a bit too high and had to use a step ladder to unhitch my strop. The trailer attaches to a rope from the strop and this is then used to winch the mast up in a very controlled manner. In fact as it turned out my Father (in his late 70s) came along so I him got them to wind the winch while I stayed on deck to guide the mast into place. In fact I wasn’t needed and stepping the mast was achieved very easily and with no drama or worry about it over balancing at an embarrassing point. I haven’t tried to un-step the mast but think that it will just be a reverse of this process. I may need a longer A frame to allow for the 3 foot straight lift before it starts to lower down. I would very much appreciate feedback on how other owners step their masts. What is your mast made of – solid wood? Have you tried a carbon one? It is carbon fibre. The problem is not the weight of the mast but the leverage affect. It can get a bit unwieldy if you try to do it on your own without something to hold down the foot. Using a very simple A frame you have complete control and no need to worry about your precious carbon mast crashing to the floor. I like your idea, but worry that the A-frame would need to be taller for removing the mast? How did your system work for un-stepping? PS just had our easiest ever mast-stepping when my son “walked” the upper end of the mast along the stbd cockpit coaming while I held the foot in place over the mast “hole”. He reported that he could hold the mast up easily with one hand, “easier than stepping a Laser mast”. But, he had the side-beam of a boat lift to hand to steady himself with using his other hand. So stepping mast is now easy with two people but un-stepping is still a night-mare, hence my questions about a tall A-frame which would hold the mast above its pivot point. I’ve not tried it for un-stepping but I’m thinking of adding a third leg and making a tripod. The third leg could be 4” x 2” timber about 10 foot long. I don’t think that this needs to be as high as the pivot point it just needs to be high enough for the leverage effect of the section of the mast to not be so much that the foot of the mast cannot easily be held. Nigel Irens describes how on at least two Roxannes there is an additional socket adjacent to the mast socket and the mizzen mast or gin pole is inserted into this to allow the mast to be winched out. I have toyed with the idea of having a socket attached near the front of the trailer and having a pole that slots into this kept with the trailer to allow for easy un-stepping.